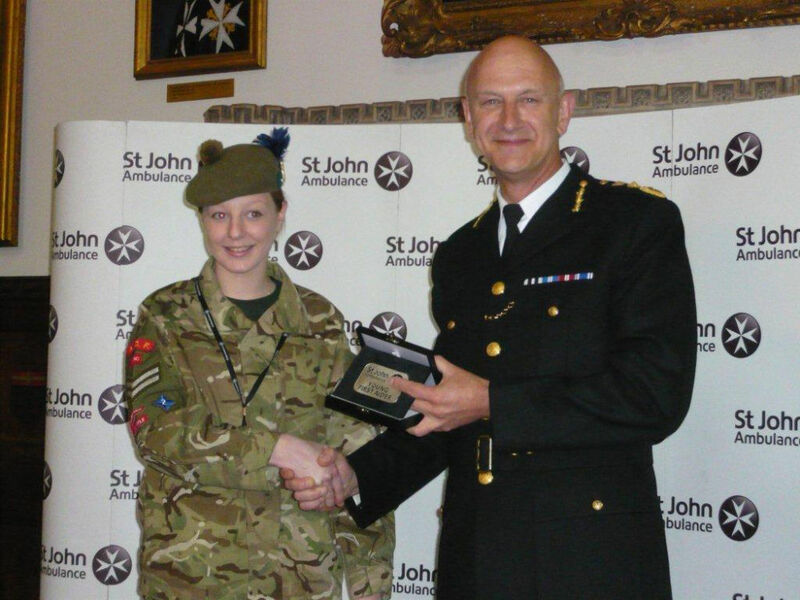 Portsoy Army Cadet Emily Reid,16, has been awarded with one of the UK’s highest lifesaving honours, St Johns Ambulance Service Young First Aider of the Year in recognition of her calm and professional actions at the scene of a road accident in Portsoy. Cadet Cpl Reid was in the vicinity when an adult cyclist tumbled off his bike. Racing to the scene Emily discovered the victim was unconscious and bleeding with wounds to his face and mouth. While her friend called 999 Emily checked the man’s breathing and ensured his airway was open. A bystander handed her a first aid kit and she used the dressing to compress the wounds and stop the flow of blood while she waited for paramedics to arrive. Modest Emily commented, “I have been in the Army Cadets for three years and love every minute of it. Among other activities we are taught first aid and all I did was put the knowledge I was taught into practice, I only did what anyone else would have done. When I arrived on the scene and saw the situation my training just took over”. The awards are presented to young people each year who use their first aid skills in serious situations.